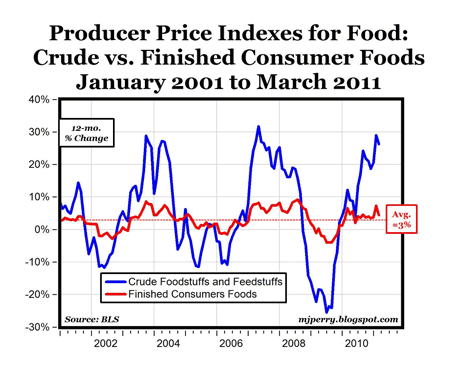 The chart above shows the annual inflation rates for: a) crude foodstuffs and feedstuffs (e.g. wheat, corn, animals for slaughter, peanuts, cottonseed, and soybeans), and b) finished consumer foods (pasta products, processed meats, bakery products, fresh fruits and vegetables, tree nuts, and eggs), based on yesterday’s BLS report on Producer Price Indexes through March. I featured a similar chart back in February and it got a lot attention and comments, so this is an update. 2. Double-digit inflation (0r deflation) rates in crude food items (like we’ve had for the last 9 months now starting last July) never translate into double-digit inflation (deflation) rates for finished consumer food products. 4. The average inflation rate for finished consumer foods over the last 12 months of 4.3% is lower than the 6.6% average during 2007 and the 6.8% average in 2008. MP: Perhaps this explains some of the disconnect between all of the news reports about rising wholesale and commodity food prices globally, and food inflation of less than 3% in the U.S. through March (2.9%), which is just slightly above the average over the last decade of 2.7%.